Like last year, my 2012 Chinese New Year was spent back in my hometown Penang where my family got to enjoy another round of good Chinese New Year Home Cooked Meal dished out by my mother. It was slightly different this time around as my mum had Janice to help her this year, twice the cook, twice the flavour. Check out what we had, and tell me why I shouldn't head home every chance I get. 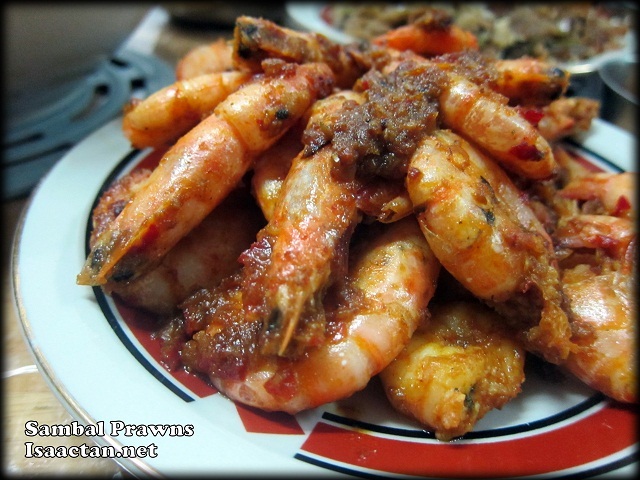 This Sambal Prawns dish was new to us, introduced by Janice, and together with Mother, out came this really tasty dish. The Sambal was home made too, spread onto the prawns like butter, which enhances the flavour threefold. 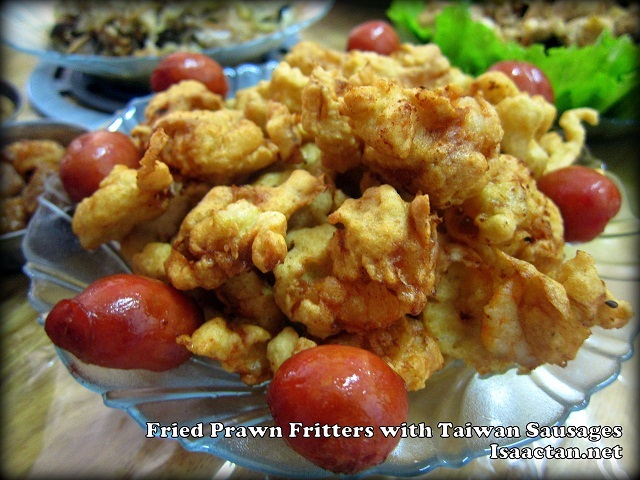 Now I love Taiwan Sausages, and it came together with lots of Fried Prawn Fritters which really satisfied my craving for these sausages. 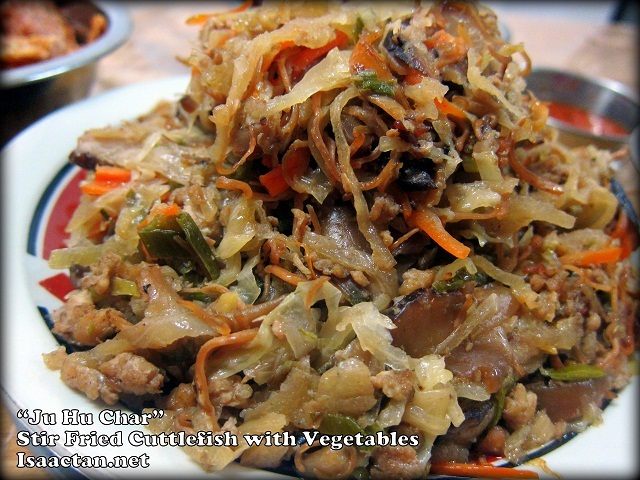 The staple dish of every Chinese New Year would be my Mother's "Ju Hu Char", where generous amounts of cuttlefish was thrown in with pieces of meat, mushroom and assorted vegetables to make a wonderful partially vegetable dish. Taken with Sambal, it certainly meets our expectations of the "must have" Chinese New Year dish. 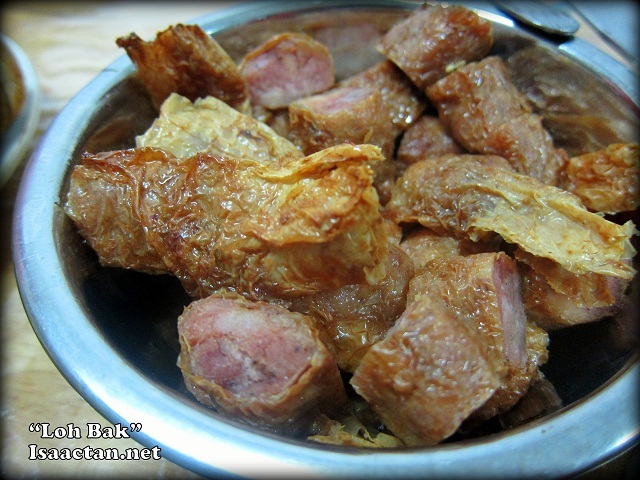 Up next was the meat dishes in the form of "Loh Bak", Meat Balls and another new dish to us, the Wine Chicken dish. 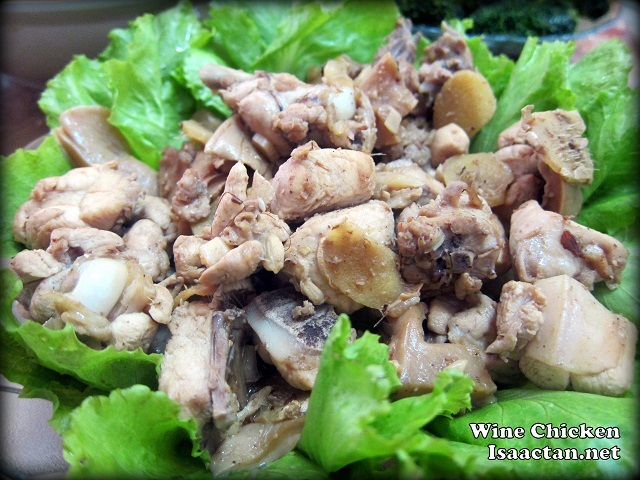 With chopped up chicken being doused in wine and lightly stir fried with ginger, I must say the taste certainly gave a strong "kick" to my tastebuds. The Assam Fish dish was a rather rare dish to pop up on our Chinese New Year menu, but it did come up this year, and it was good. Cooked nyonya style, with various types of herbs or leaves inside, just smelling this dish gave me an appetite of a horse, or more appropriately, the appetite of a dragon this year. 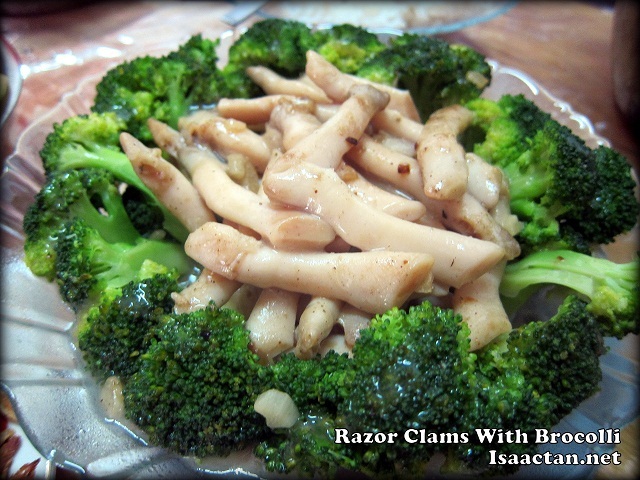 Razor Clams with Brocolli, the name itself sounded really exotic to me as I haven't really tried this dishbefore. 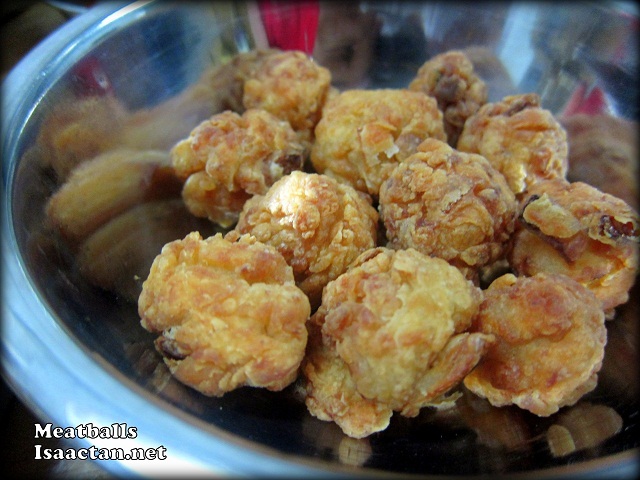 The taste was a mix of chicken and oyster, with a rubbery texture. Taken together with broccoli, I was contented this year. It was a really good meal at home, and I must say, the tag team of Janice and my Mother works really well and is reflected in the food. I can't wait for my next trip back to Penang. wow..with such good food, you should go back to Penang every now and then!! Better than KL food anytime, huh! homecook food feast.. great one ler..
wow..your mum cooks so well..
Hmmm I tot Too many cook spoil d soup. Next time I go to Penang, you let your mum know - I will go to their house for dinner! 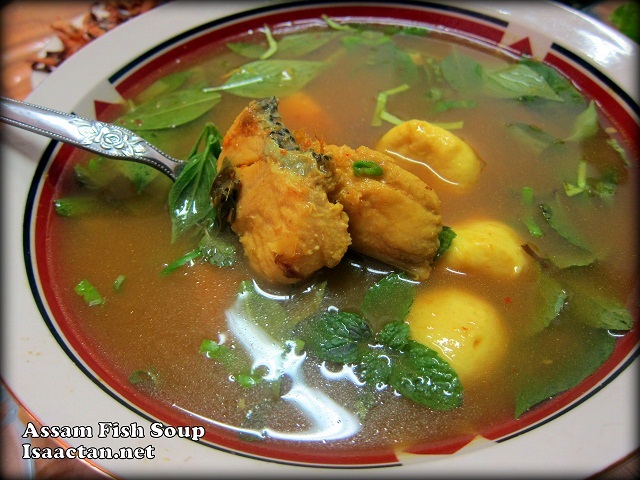 True-blue nyonya...best cuisine in the world. I hope Janice knows how to cook as well...or will learn and pick up her skills. Most young girls (and boys) today are not bothered - just know how to eat and eventually, the whole culture will fade away. Sad, really sad. :O SAMBAL PRAWNS. Mouth watering food wei !